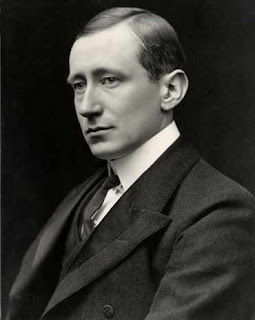 Marconi was a frequent visitor in Middleboro. Not for a social stop, but it so happened he was journeying from his wireless station at Wellfleet to New York where he had headquarters. There was considerable interest and a bit of newspaper publicity from time to time about what he planned to do. And that activity brought up many inquiries about what might be expected. City newspapers, always alert to delve into the unusual, had many questions to ask about what was going on. And it happened to be the chore of the Middleboro correspondent, J. F. Creedon, to ask the questions and gather the information from Marconi himself. He was intercepted at the Middleboro railroad station, between the time he arrived on the up-Cape Cod train and the time he took the boat train to Fall River. At that time he was a comparatively young man, faultlessly dressed, with an attractive fur coat with a fur collar, at this time of year. He had an uneasy way, and during the time he was in Middleboro awaiting the train change he never sought a seat in the station. Instead he busied himself walking the station platform, impatiently awaiting arrival of the other train. Except that when he was asked about his new communications method, which seemed so unreal then, he would explain its manner of operation and what he expected would develop from it. He was a considerate man and did his best to explain the details to a juvenile writer and questioner, who didn't have too much background in matters electrical to digest it all. He was co-operative and felt it would go a long way to speed up long distance communications, without wires by land or cables by sea. Brockton Enterprise, "Recalls Chat with Marconi", December 13, 1951.